There are a myriad of features that we can all actively seek when bolstering our computer experience. This can include an ergonomic keyboard to reduce your chance of developing carpal tunnel syndrome, a vivid LED screen that will display colors beautifully, or even a back supporting, ergonomic office chair that’ll make our work and our gaming a much more comfortable experience. Funnily enough, there is one structure that ties all of these disparate features together: The computer desk. The computer desk houses all of our computer components, from our mice to our towers and finding one that is quality is tough with so much competition on the market today. Fortunately, we’ve rounded up some of the best items on the market and comprised this handy guide that’ll make your next computer desk purchase much simpler. It’s hard to enter a major furniture retailer today and not come across a Z-Line product; as a matter of fact, this line of affordable home and office furniture is featured twice in this guide. Z-Line began two decades ago in 1995, and has grown to become one of the leading import manufacturers of furniture in the country. 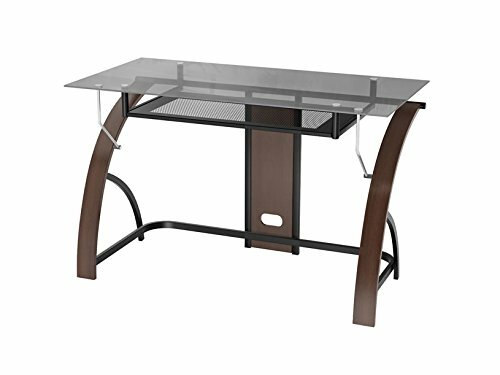 Many of their products sport “Z”-shaped bracing and the company produces some of the most modern looking desks and home entertainment centers on the market today. As our Gold Pick and as a quality Z-Line product, it’s easy to recognize the features that make this product our number one computer desk. Firstly, you’ll notice that the primary surface is comprised of relatively thick tempered glass. It’ll hold a lot of items safely and is supported by chrome cylinder glass supports that also look very attractive when viewed from different angles. The implicit sturdiness that is provided by these supports is coupled with metal grating on the sides that is strong and durable. On either side of the lower desk, you can place computers; as a matter of fact, some users use each side for two separate machines. The entire desk rests on five castors, four on the outside and one on the inside, that make moving this 71.7 pound desk a breeze. These castors are relatively small, but are responsive and oiled enough to make even moving them across a carpeted floor very easy. Z-Line hasn’t incorporated their “Z”-shaping into any aspect of this desk, but it still manages to look very futuristic with its two tiered construction (there’s an extra shelf on top of the tempered glass where you can place a monitor), its curved bottom wood grained surface, and its efficient cable management system. The desk’s measurements are 26 inches in depth, 48 inches in width, and 36 inches in height. All of the wood grained surfaces feature a cherry finish that also sports black accents. The main glass surface also incorporates black edging. This is a great aesthetic feature, but it’s also there for safety, as the material there will hold the desktop together should unfortunate accidents occur. Under the tempered glass is a very sturdy keyboard tray that has ample room for a mouse. This tray moves smoothly and isn’t prone to disconnects and track misalignment like some other contemporary computer desks. As mentioned previously, this desk sports a very elegant cable management system. Positioned along the back of this desk is a grated metal support structure. In the middle of this structure are three holes that you can run your cables through. The bottommost is there to run cables out of the back of your computer, the hole on the second level, which rests above the glass top, is there for cabling for speakers and wired devices like chargers and power supplies, the final hole is there to direct cabling for monitors. 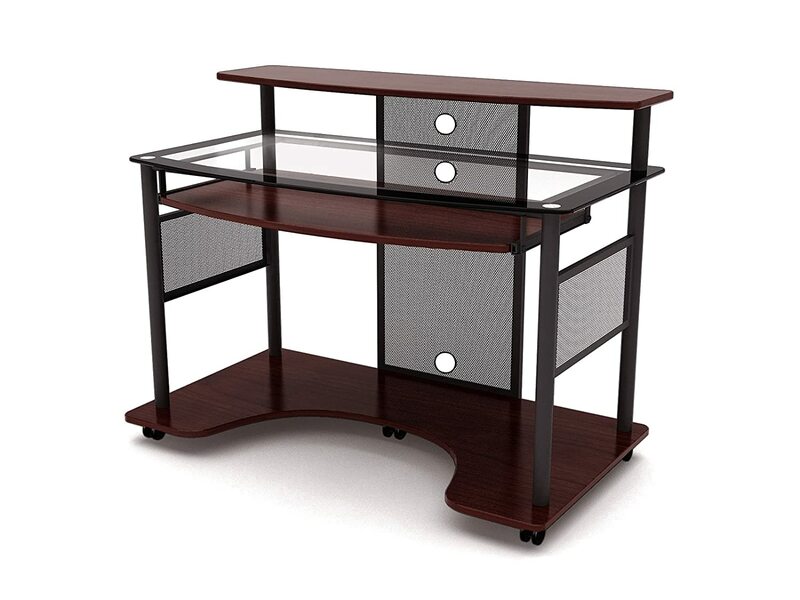 Our Silver Pick desk comes to us from Sauder, a furniture brand that is a family owned company. Sauder started out in 1934 as the brainchild of woodworker Erie Sauder. Then in 1954, the company expanded its product lines to include one of the first snap together tables ever. Since then, the company has steadily grown and become one of North America’s premier producers of ready to assemble (RTA) products. 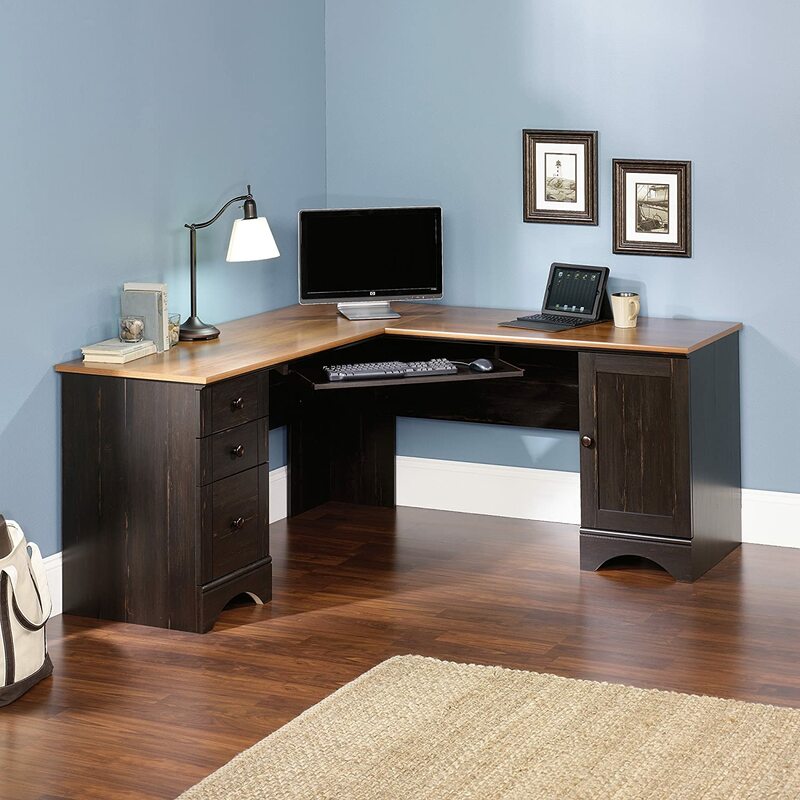 Their Harbor View computer desk incorporates the timelessness of such a strong brand and brings it into the modern technological age. The first thing you’ll notice about this computer desk is the fact that it has a somewhat old-timey flair to it. It incorporates filing drawers and antique wood tones into its design; the result is a meshing of the modern and the classic. The wood grain is ash colored and has a degree of aging in its worn-looking finish, though you’ll quickly see that this is just a design note and not the actual state of the wood. This “antiqued” look adds a timeworn aesthetic to the desk that’d be at home in any room with a wood themed décor. The unit itself is a corner desk, meaning it’s built to be best suited in a corner area since it comes in a right angle configuration. The keyboard tray, which is large enough to fit a standard mouse, is sturdy and slides fairly easy out of its housing when you need it. Unfortunately, there isn’t much in the way of cable management, but the setup of all the computer alcoves really doesn’t make this much of an issue. Topping the unit is a durable melamine top surface that is resistant to nicks, dents, and warping, and it is also several shades lighter than the ash-colored cabinetry and computer tray. The whole desk is about 30 inches tall and features an angled surface that is about 93 inches from tip to tip. Also, the large center area is big enough for a sizeable office chair. Looking at the desk, you might ask, “Where does my tower go?” The answer lies in the two interchangeable cabinets that frame this desk. These two cabinets are designed to serve as a file cabinet on one end and a home for your computer tower on the other. The two are fully interchangeable in order to accommodate both righties and lefties. Our next desk comes from Monarch Specialties, a Quebec-based furniture manufacturer who has traditionally marketed their product to retailers. Fortunately, with the advent of sites like Amazon, you can now access their catalog of fabulous furniture directly by shopping online. Our Bronze Pick desk shares a few design accents with our Silver Pick product. 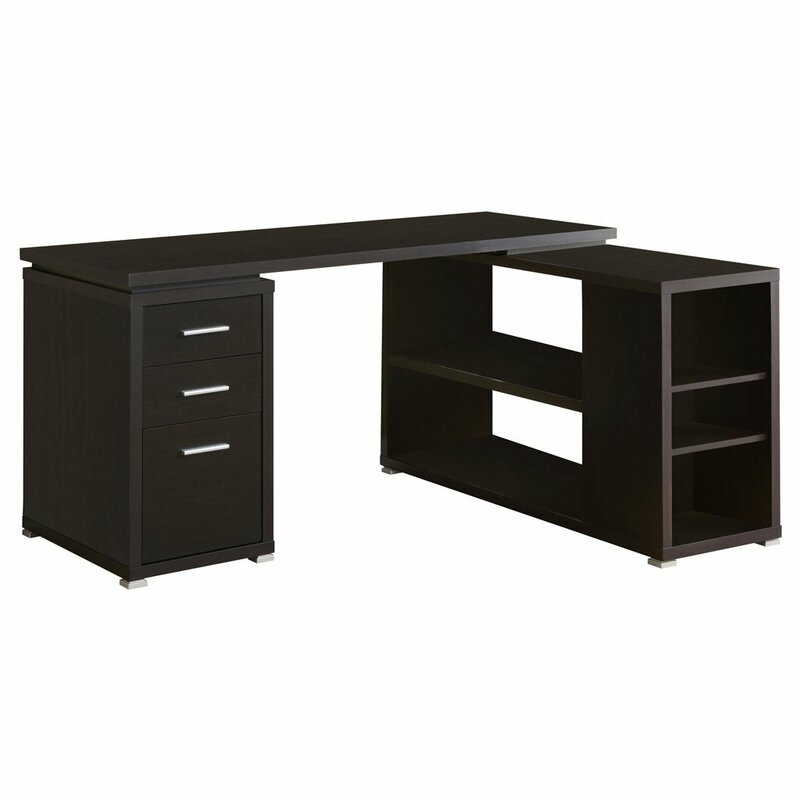 Both desks are L shaped, and both have cabinetry for file storage. Where the two differ is in the overall design aesthetic. Whereas the Silver Pick utilizes a rustic design, this product is firmly planted with a modern look. You can choose from three distinct colors: the default cappuccino, the soft wood grain tones of natural, and simple white. Each drawer in the cabinet area has metal handles for ease of opening and a similar material is used for the feet of this computer desk. The metal materials set upon each of these tones more natural tones provides an interesting accent that’ll shine in many decors. The desk, while still being L shaped, has a very different seating arrangement from our Gold Pick desk, in addition to this, there is no dedicated space for your computer tower to be stored. This means that you’ll either have to place your tower on the floor beside the desk, or utilize a laptop for computing on this attractive piece of furniture. While this might be an inconvenience for some, there is still ample space in the areas around this desk to hide a reasonable sized computer system. Also, there is no computer tray on this desk, but once again, the top surface will provide more than enough space for a keyboard and mouse. When sitting at this desk, you’ll have access to your files and paperwork on your left hand side and access to a series of shelves on your left. These shelving surfaces are the perfect place to put a printer or other computer paraphernalia, and both the 60 inch main desk area and its adjoining 29 inch side desk area provide more than enough room to store a flat panel monitor and speakers. If you’re looking for a new computer desk but don’t have a whole lot of cash to spend, then maybe you should consider our ballin’ pick. It is manufactured by the same world-class company as our Gold Pick and even has a few of the features that you’d find on that really popular item. It even sports the classic “Z”-styling that Z-Line has made famous in many of its furniture lines. Simplicity is the name of the game when it comes to this stylish computer desk. It doesn’t actually sport a lot of surfaces, lending a somewhat sparse looking design to this desk’s primary aesthetic. The sides feature curved legs, which support the desk through metal braces and wood accented laminate. Similarly to our Gold Pick Z-Line desk, this desk also has a tempered glass top that is protected, around the edges, from incidental damage. Like our Gold Pick, this glass top is kept in place by chrome cylinder glass supports. The foot area of this desk is very spacious, and though there is no dedicated computer tower space, there is still plenty of room to place any computer case, even a full tower, within this space. The keyboard tray is made of very strong, vented metal and slides out easily. There is also more than enough room for a standard gaming mouse in this area; as a matter of fact, Z-Line has created this specific model of desk with computer gaming in mind. Underneath the main desk area, there is a hole for dedicated cable management and even a very solid bar for you to rest your feet during gaming sessions. It’s very important to get a computer desk that’s the right height for easy usage. Optimally, a computer monitor should be at the right height in order to protect your eyes from over-strain. The proper placement of a computer monitor should see that the top of the screen should be at approximately your eye level. This will ensure that your eyes won’t have to strain during everyday use, which can lead to greater damage over time. When searching for a new computer desk, try to avoid models that place the monitor too high or too far away from where you comfortably sit; your eyes will thank you. Wood – This is the material with the most possible variations. Wood quality will greatly differentiate based on the type of wood is used in the construction of the desk. Where oak desks can be incredibly sturdy and long-lasting, they can also be much more expensive than a desk comprised of balsam, which isn’t as strong. Avoid cheap materials like particle board which tend to degrade quickly and you should be happy with your wooden desk, though all wood types can knick easier than our other materials. Laminate – The most popular material in modern desks. Even desks that appear to be constructed of wood tend to be simply laminate with a wood-toned veneer. Laminate is relatively cheap, and if you select a thick, high pressure laminate, it will last you for years. Cheaper variations will warp and will tend to cause you trouble the longer you own it. Metal – These types of desk are unquestionably sturdy. Most metals are durable enough materials that will last decades, though problems like rust, scratches in the finish, and warping can all happen with this style of computer desk. Also, metal tends to keep coolness longer than other materials, which can be uncomfortable at times. Keyboard Tray: Some consider this to be a basic requirement when you buy a desk of this type, but many actually don’t include this seemingly vital enhancement. A good computer keyboard tray has ample room for not just your keyboard, but for your mouse as well. Also, your keyboard tray should be sturdy enough to manage the consistent extra weight placed on it by your hands; there have been many a paltry desk that has lost its computer tray after mere months of usage. Castors: These are the small wheels that you find at the base of some furniture. Computer desks that add castors to their design are much easier to truck around the home or office because they utilize these small wheels. The best types will have wheels that won’t get stymied by the kinds of carpet you’d find in a home or office. Drawers: If you are using your computer desk professionally, nothing is easier than storing your extra files and notes in an attached drawer. This will keep your important documents within arm’s reach and allow for easy filing when you need to consolidate your information. Height Adjustment: This feature ties in with our first consideration. Not all desk users are of the same body type. Some taller users find that desks that feel great for a standard user actually hurt their knees because of the low slung height. To counter this, some desk manufacturers have produced desks that allow for a user to adjust the height, so that taller users don’t have to feel hemmed in and squished. No one wants a desk that won’t support your habits. A strong, durable computer desk with ample support for all of your heavy computer components is a truly valuable product. To ensure durability, you can select any of the materials that we have listed in our materials sections, but any of them can let you down if you’re not careful. To ensure your new desk is durable, look for features like chrome cylinder glass supports for glass-topped desks like our Gold Pick or a strong durable finish on the top section of the desk like the one featured in our Silver Pick product. Attractiveness in a computer desk can pull the overall aesthetic of a room together in an attractive way. Fortunately, there are a myriad of option in computer desk visual aesthetic on the market today, ranging from desks that sport a futurist design, like those offered by Z-Line, to desks that have a classic feel to them like those produced by Monarch Specialties. When selecting a new computer desk, just remember: how your desk fits in with your room’s décor will greatly affect how you work in that room. 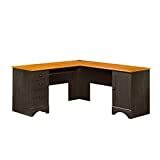 It’s great to have a solid computer desk that has excellent features, beautiful design, and will last you for many years. As you make your selection based on the offerings we’ve covered that are provided by companies like Z-Line, Sauder, or Monarch Specialties, remember that each will provide an entirely different experience from the other. Take your time and read through our pre-purchase considerations again, so that you can make an informed decision about which will be best for you. If none of these fit, then the considerations can still help you find something that’ll fit your own preferences.